XANT is a manufacturer of midsize (50…330kW) turbines for the microgrid and off-grid markets. XANT turbines are designed with microgrid applications in mind and a with a special focus on remote areas and harsh operating conditions. They have Just Enough Essential Parts (JEEP! ), fit in 40ft containers and can be erected without a crane. For deployment in typhoon-prone areas the turbines can be lowered to the ground, also facilitating the maintenance. XANT turbines have the capability of active power curtailment and can be equipped with integrated energy storage to allow for a high penetration rates. Powered by 3E and VYNCKE, XANT can rely on more than a century of experience in the renewable energy sector. Based upon the most ground breaking technologies XANT’s goal is to bring tailored midsized wind turbine technology to projects that enable farmers, industries, schools, villages and resorts to reduce energy costs anywhere in the world. With our in-depth experience in midsized wind technology we offer you a easy solution for every application and region. 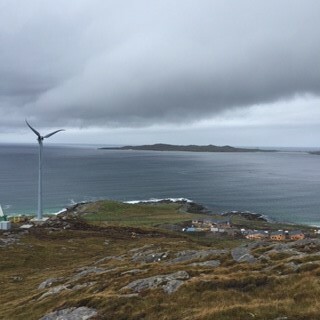 The XANT turbines have been specifically designed to address the challenges of installing and running wind turbines in remote locations of developing countries. The most failure-prone parts have been eliminated or simplified in XANT turbines, ensuring maximum run-time with minimal maintenance. XANT is currently adding partners to its dealer network to sell, install, and service its turbine product lines. The current XANT business models sets forth a specific relationship with our dealers. We are not a dealer, nor are we a developer. XANT is a plug and play mid-size wind turbine producer seeking a win-win with our sales and after-sales partner. Effective educational / sales & marketing tools. Advanced SCADA system for remote monitoring and analysis. The XANT wind turbine product portfolio consist of the XANT M (100kW platform) and the XANT L (330kW platform). Both models are available in IEC class I and class III versions (for average wind speeds up to 10m/s and 7.5m/s). A XANT M class IV (average wind speeds up to 6m/s) is under development. IEC-certified wind turbine designs (DNV-GL and TÜV-SÜD). No headaches thanks to the JEEP (Just Enough Essential Parts) principle. Easy transport: all components fit in a 40-foot container. Easy installation: crane-less erection with a tilt-up tower, concrete-less foundations if soil conditions permit. Silent operation thanks to advanced aerodynamics and a low blade-tip speed. 2-year Limited Warranty standard, 5-year Limited Warranty upon request.